Across Queensland, there are more than 45,000 bodies corporate managing over 400,000 apartments and townhouses.That means about 20 per cent of people have some connection to a body corporate, but many owners and tenants still don’t understand their rights and responsibilities and too many believe in myths. There has been an explosion of unit owners during the last two decades. However, still too many owners still take scant interest in their buildings. Back in the old days, prior to the legislation changing 13 July 1997 a body corporate manager was usually the chairman, secretary and treasurer in most instances. There was no internet, no email … So the owners of units were very ignorant and in a lot of cases, just didn't care. They didn’t know anything about the legislation and they didn’t want to know. The main difference today, apart from greater numbers of apartment owners and tenants, is improved education and easy access to more information. Still, many unit owners fail to get involved in their body corporate and often pay a high price for it. Owners that don't pay attention to the look of the building and the maintenance of the building end up falling behind. Because they have not been involved in the general running of the body corporate including maintenance they then complain when they can't rent their unit because the building is looking dowdy. Ignorance is bliss but it comes back to bite. Too many unit owners don't seek to care about the managerment of their building. The big message here is that apartment owners really can’t afford to stick their heads in the sand and ignore body corporate meetings and issues. There’s too much at stake in the running of their buildings. Owner or tenant, you’ve got obligations and rights whether you want them or not. You might choose to not attend meetings or vote to have your say on how your building’s run and fees are determined. But you can’t opt out of paying those fees or complying with the by-laws. It is also quite common for owners and tenants to believe in a variety of myths, which include that there are “standard by-laws” when in fact each scheme adopts its own unique set of by-laws, and that pets cannot be banned from complexes. Bodies corporate can’t make unreasonable by-laws, such as the banning of all pets, but they can still develop guidelines that must be adhered to by owners and tenants, such as demanding that a noisy pet be removed. More myths include the idea that anyone, including residents, can park in visitor car parks or that owners can complete renovations such as the installation of timber floors without appropriate approvals. 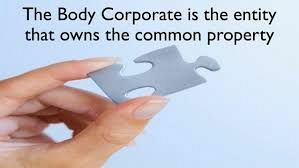 So take the time to be involved with the decision making of your body corporate. You are paying pretty hefty fees in some cases so don't miss your opportunity to voice your opinion with the end result being that your property is being maintained in all aspects.